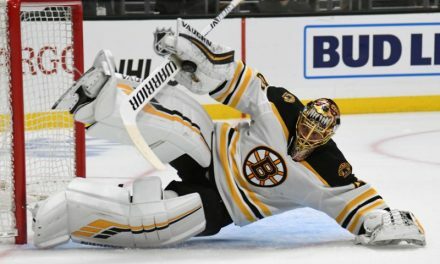 With two games left to the regular season, and a guaranteed spot in the Playoffs, the Boston Bruins brought some fire last night in Columbus as they defeated the Blue Jackets 6-4. In a win that certainly felt like a Playoff game, the boys in Black and Gold were back to form after dropping their last two games. And for one particular player, last night would be one to remember as teammates swarmed number 63. With the win over the Jackets, the Boston Bruins have now clinched home ice in the First Round of the Playoffs when they face the Toronto Maple Leafs, who lost last night to Carolina 4-1. 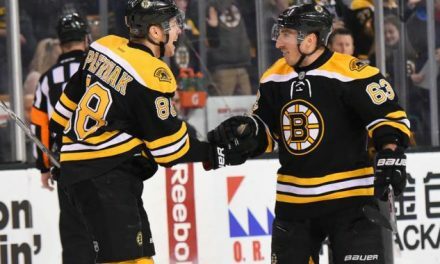 Jake DeBrusk netted two goals, Marcus Johansson scored his first goal as a Bruins, David Pastrnak scored a goal and Marchand scored-leading to his 100th point of the season. Torey Krug and David Krejci also had career highs in assists. DeBrusk has scored four goals in his last four games, and has tallied up 27 goals so far this season. He also picked up an assist on Karson Kuhlman’s goal. DeBrusk’s first goal was credited to him after a lucky bounce got past Sergei Bobrovsky. 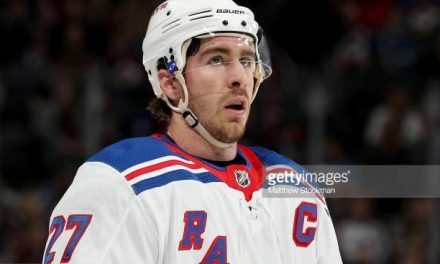 Johansson scored off a rebound that was set up by Charlie Coyle. Krejci notched his 52nd assist last night, while Krug accumulated his 47th assist. David Pastrnak scored off an assist by Patrice Bergeron. 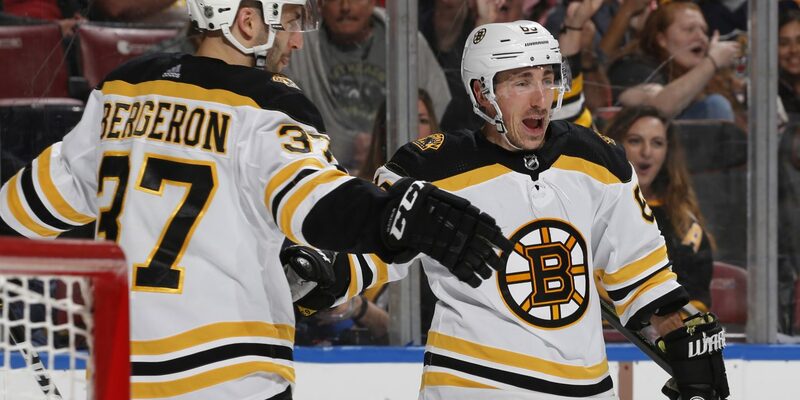 The Boston Bruins were able to snap Columbus’s five-game winning streak last night. Bobrovsky was pulled from goal after Boston scored their fourth goal. Joonas Korpisalo took over and allowed two goals. Oliver Bjorkstrand scored in the third, putting the Jackets on board with their first goal of the night. Matt Duchene scored a power-play goal off a pass by Artemi Panarin (who has eight points in his last six games). The Bruins continue with their road trip as they face the Minnesota Wild on Thursday with an 8:00 pm. start time. 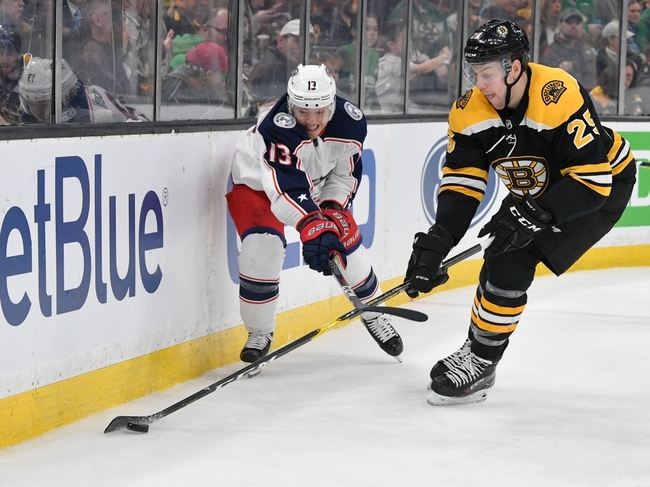 Columbus will look to clinch a Playoff berth when they face the New York Rangers this Friday.
.@JDebrusk scored twice and @Bmarch63 reached the 100-point mark as the #NHLBruins got back on track and clinched home ice in Columbus. 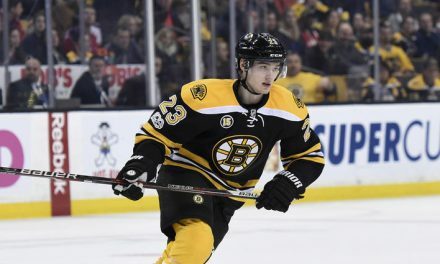 Who Will Be on the Bruins’ Third Line?